I have been reading to Aaron since he was a baby, and we have an incredibly large book collection, so it is no surprise that he loves books, loves reading. 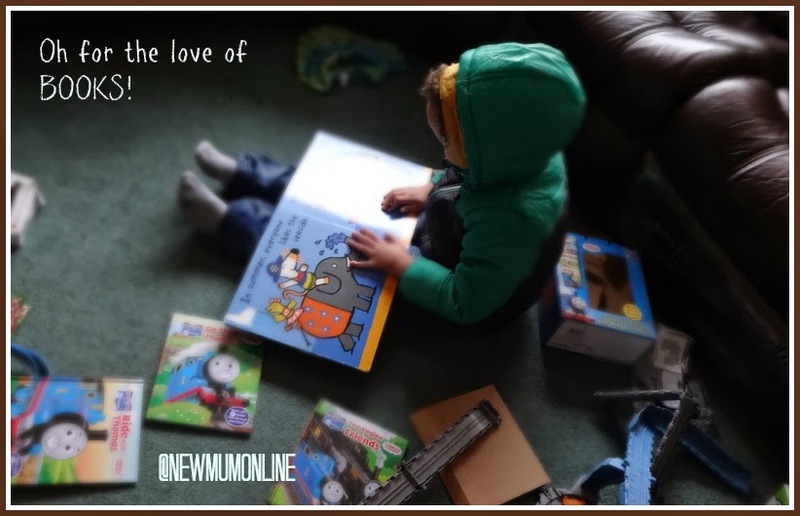 He used to insist that I read with him, but now he loves reading by himself, and he'll invent the words to go with the pictures, unless of course it is the Gruffalo which he knows off-by-heart! This story and picture would have been lost in my mind (the former) and saved on the computer (the latter) were it not for Brina Bird's Blog Post which also shows a boy who loves reading. I am so so glad my love of reading (and sleep) has been passed on to Aaron. I don't envy Rachel her 5 a.m. starts. But Harry sounds like a complete delight though, which I am sure makes up for the early morning calls. Another beautiful thing that's happened today, is on the way back from nursery, Aaron shouted what I thought was DADDY at the top of his voice. He was a few steps ahead of me, so I ran up to him. I asked him to repeat it and he was looking at the road really distressed shouting BIRDIE. He was terrified they'd get knocked over and then went on to tell them that a car was coming. Because we are always out and about, him on his bike and me walking (because I don't drive) his road safety is really really good, and he was trying to pass on his road-sense to the birds bless him! I should have included Aaron in the pic, but a car was indeed coming, so I wanted to QUICKLY capture the birds whilst the coast was clear - I had a matter of seconds to get the camera out and turned on.